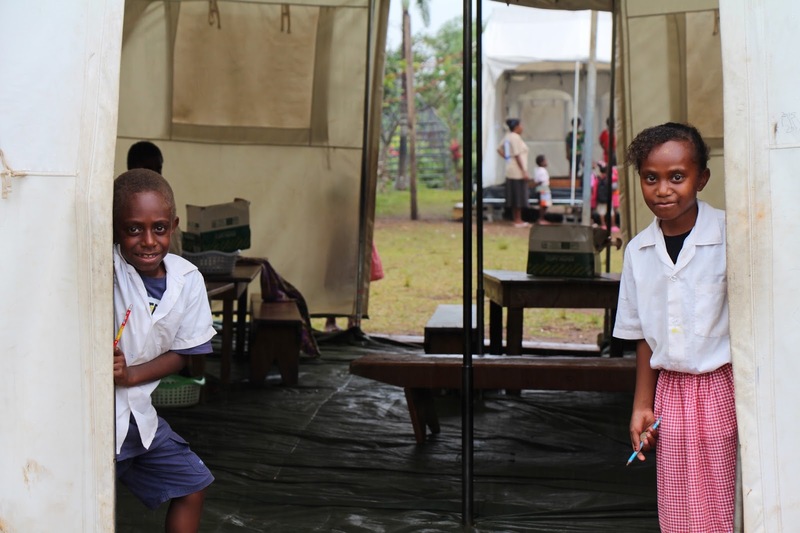 Joana and Daisly used to miss school regularly before Cyclone Pam hit Vanuatu. The unique experience of learning in a tent has brought them back. When Joana and Daisly share their experience of Category 5 Cyclone Pam, I can hear the horror of that night in their voices – voices that remind me of my two young sons and our own night of terror. 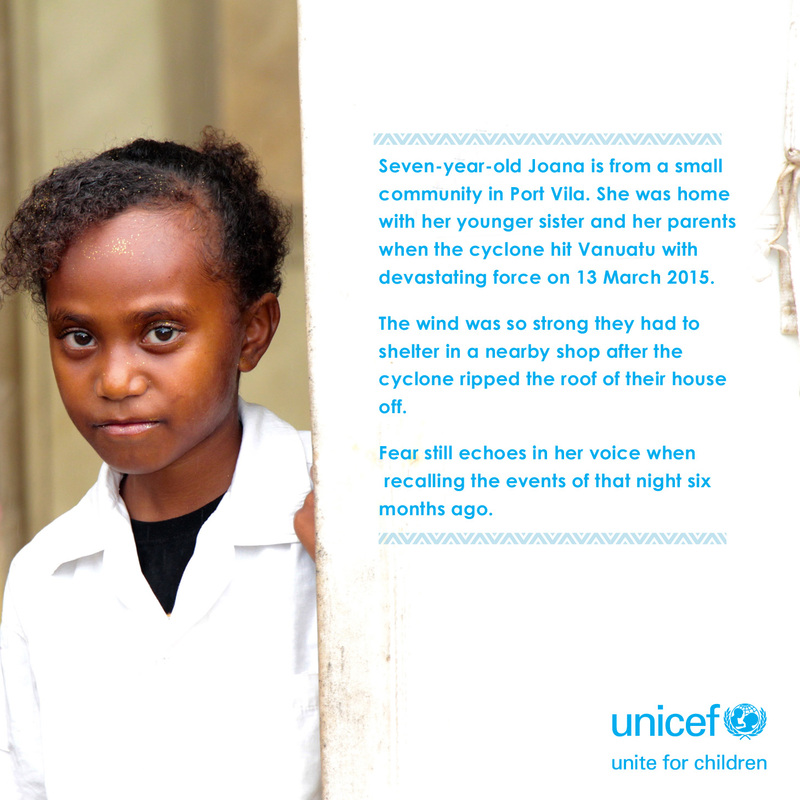 Seven-year-old Joana is from a small community in Port Vila. 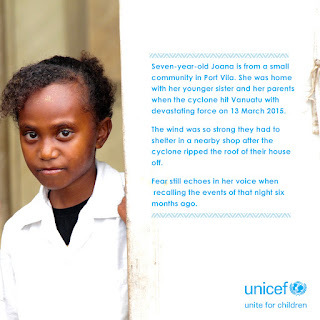 She was home with her younger sister and her parents when the cyclone hit Vanuatu with devastating force on 13 March 2015. She tells me the wind was so strong they had to shelter in a nearby shop after the cyclone ripped the roof of their house off. Fear still echoes in her voice when recalling the events of that night six months ago. Joana’s school friend Daisly, also 7 years old, lives with his parents and his baby sister at Freswota, another neighborhood of Port Vila. He did not always live there. Daisly vividly remembers his parents packing their clothes the afternoon before the cyclone hit to move to a safer place. His voice becomes a whisper as he tells me how scary it was for him and his little sister. He also tells me how grateful he is that the family found refuge somewhere else; the next day they returned to find their house completely destroyed by the cyclone. One of UNICEF’s priorities is to bring children back to school as quickly as possible after disaster strikes. Amongst other measures, UNICEF provides tents for temporary learning spaces, school backpacks, learning materials and school supplies. Joana and Daisly are among the 280 children of Kawenu Primary School in Port Vila who received UNICEF backpacks. 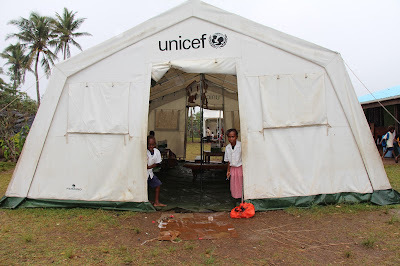 Their classrooms, destroyed in the cyclone, has been temporarily replaced by a tent. Although communities are quickly recovering from the cyclone, important infrastructure like classrooms need to be funded and built to agreed standards so they tend to take a little longer to fully replace. Six months on from Cyclone Pam, more than 6,000 children like Joana and Daisly are still attending classes in temporary tents provided by UNICEF. Daisly also likes learning in a tent, but for less obvious reasons. “It’s funny. Look, when it rains, the water comes out of this hole,” said Daisly pointing at a drainage funnel on the side of the tent. It was clear from the children’s expressions when they described their temporary classroom that it was a novel experience. The children have made it their own – decorating the inside of the tent with their pictures and writing. I left the school gate amidst calls of “UNICEF!” from the girls and boys preparing for their musical concert in a few nights’ time. The rehearsals and concert are being held in the second tent the school received from UNICEF, a reminder that school is so much more than formal classes; these cultural and social experiences are just as much a part of learning and growth for young children as anything else. Six months after Cyclone Pam, it’s clear that, despite many challenges, communities are well on the road to recovery. And for resilient and optimistic young children like Joana and Daisly, even temporary inconveniences like tents have a silver lining.